It may seem ironic that this article contributes directly to the saturation of noise, clatter and the endless information overload we experience in the 21st century. Noise is not only audible, it’s also interior. The image of the young man listening to music, whilst reading a text message, whilst presumably working on his laptop, speaks volumes. We have already considered in the article Prayer I the most basic of non-verbal prayers: making the sign of the cross. This is perhaps the most common form of physical prayer, used all the time throughout the day by faithful Christians. Making the sign of the cross gives us a small moment to leave the constant noise of the world and lift up our hearts to God. In the din of our world, we need to create opportunities for ourselves to be silent. These non-verbal prayers allow us to shut up the hubbub and instead be still with God. We need to shut up, turn off, and quieten even our minds. Retaining interior silence is a very necessary aspect of non-verbal prayer, but it is only a partial reason why prayer with the body is important. Our body is an intrinsic part of our personhood. It is an error to suppose that our bodies are merely ‘fleshy empty vessels’ whose job is simply to contain our immortal souls. Our bodies are saved together with our souls. Apart from the numerous physical healings performed by Jesus Christ described throughout the gospels (and subsequently in His Name through his saints) Jesus’ physical body was resurrected from the dead. The body is important. The Holy Women and the Apostles did not bare witness to a ghostly apparition of the resurrected Jesus. His body was transformed but it was physical. They could touch him. He cooked for them. St Thomas put his hand into His wounds. The same is true for us. Our bodies are being saved as well as our hearts and souls. 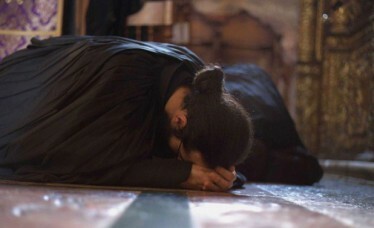 Orthodox Christians constantly pray with their bodies without words. A common action is to perform a metania. This is a natural extension of the sign of the cross, and includes a bow from the waist. The metania is a way of offering our physical selves to God in a gesture of humility. Very often Christians will venerate an icon using metania before bestowing a kiss on the image, again as a self-offering of love and humility. Less frequently, Christians will perform full prostrations. These are a more profound offering of our entire selves, body, mind and soul, to Our Lord Jesus Christ. Prostrations are more often associated with Islam rather than Christianity, although it was Islam who learned the practice from Christianity, not the other way round. It’s interesting to note that Christians may formally greet each other using metania or sometimes prostrations. We are also icons of Christ, made in the image and likeness of God. Live simply and without thinking too much, like a child with his father. Faith without too much thinking works wonders. The logical mind hinders the Grace of God and miracles. Making the sign of the cross, performing metania and prostrations, are all ways in which we start to sanctify our bodies, setting them apart for the worship and glory of God. As unique parts of ourselves, our bodies journey towards salvation alongside our hearts and minds. Not as empty vessels, but as fully part of our true selves, it is absolutely appropriate to take time to pray with our bodies, which will be resurrected to be rejoined with our souls on the Last Day.